The J.D./M.B.A. Program is available to Day Program students only who must secure separate admission to the Business School. 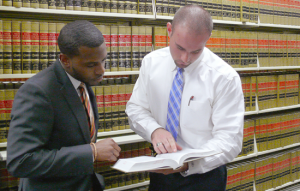 This program enables a Day Program student to receive the Juris Doctor degree and Master of Business Administration degree in four years instead of the usual five years. The Juris Doctor degree is granted upon the completion of a minimum of 88 semester hours of required and elective law school courses. To obtain the Master of Business Administration degree, the School of Business requires a total of 33 semester hours of required and elective courses for the student with an undergraduate business degree meeting all foundation course requirements, or 60 semester hours of required and elective courses for the student who needs credits in the foundation course areas. Law students will not be required to take the GMAT or GRE, the School of Business will instead accept their LSAT scores. Law students will be allowed in the Business School after completing their first year in the Law School. Applications for the Fall Semester are due by June 1, but are reviewed on a rolling basis. For more detailed information, please contact the School of Business at 919-530-6405 or visit their website at www.nccu.edu/academics/sc/business/mba . Law students interested in this program should also contact Professor Reginald Mombrun. Download the PDF guide for J.D./M.B.A. program.